But margins are pretty slim for the emerging energy storage division. Meanwhile, Tesla’s solar business continues to decline. Tesla said residential solar deployments have been affected by a short supply of home batteries. While Tesla is struggling to ramp up production of its Model 3 car in the coming months, it’s got another aggressive growth target in front of it: a big production ramp-up for its energy storage products. In Tesla’s fourth-quarter and full-year 2017 earnings report released Wednesday afternoon, the company said that it plans to at least triple the amount of energy storage capacity it deploys in 2018 compared to 2017. “[T]he production ramp of our storage products is just as steep as with Model 3,” the company wrote in its letter to shareholders. Tesla sells large-scale battery packs, called Powerpacks, that can be plugged into the electric grid and provide services for utilities and companies or be paired with solar and wind farms. The company also sells the smaller Powerwall unit that provides services, such as backup power, to homes and small businesses. Tesla has long maintained that it sees big growth potential in its energy storage division, but it has prioritized its automotive business, including the Model 3. By setting aggressive growth targets for its energy storage division for the year, Tesla is showing it’s finally taking the prospect of growth in the sector more seriously. However, the Model 3 and Tesla’s massive battery factory, the Gigafactory, will still get the bulk of the company’s capital spend for this year -- as they did last year. The automotive business also brings in much of the revenue. For the full year of 2017, Tesla generated $11.76 billion in revenue, which was a jump from the $7 billion in revenue it generated in 2016. Just $1.12 billion of that revenue in 2017 was from its combined energy storage and solar division. Musk threw down the gauntlet last summer for the company's energy storage group and made a bet via Twitter that Tesla could install 100 megawatts of energy storage in South Australia in 100 days' time. Tesla achieved that goal and built the world’s biggest battery farm next to a wind farm near Jamestown in South Australia. Tesla said in its shareholders' letter that the success of the South Australia project has led to “an increase in demand” for the Powerpack. “It’s clear that there is a huge opportunity for us in large-scale energy storage,” wrote Tesla. 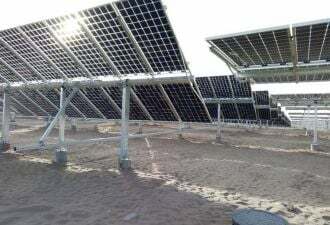 In addition to the South Australia project, Tesla has also built large battery farms on the Hawaiian island of Kauai, on the island of American Samoa, in Connecticut, and on multiple sites in California. This week Tesla said it managed to score another deal with South Australia to install up to 50,000 Powerwall batteries in homes, paired with rooftop solar panels. Tesla is also building kiosks at Home Depot and Lowe’s stores that would show off and sell the Powerwall, combined with solar panels. 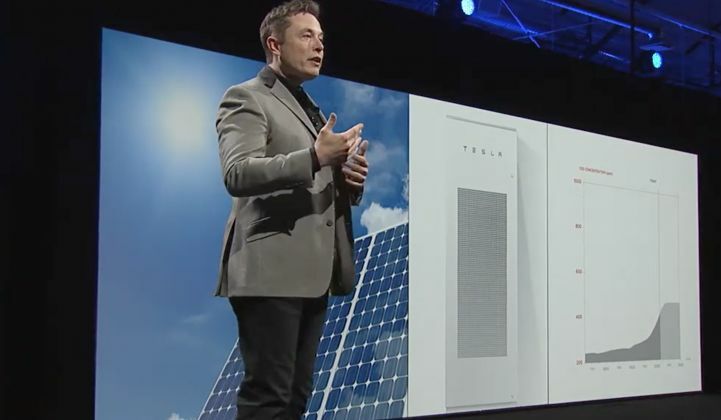 The energy storage business is valuable for Tesla in a variety of ways. It’s a way for Tesla to diversify outside of the consumer-driven business of selling cars, which can be a fickle market. It’s also a major growth market in its own right as utilities look to add more clean energy and reduce their reliability on coal and nuclear. Tesla said that in the fourth quarter of 2017 it deployed 143 megawatt-hours' worth of energy storage products, growing installations 45 percent from the same quarter the year before. The 129 megawatt-hours of energy storage built in South Australia last year will be recognized in the first quarter of 2018, Tesla said. While Tesla’s energy storage products are seeing significant growth, they appear to have relatively low margins for the time being. The combined gross margin for the division that comprises both solar and energy storage was 5.5 percent in the fourth quarter of 2017. That’s compared to a 25.3 percent gross margin for the division in the third quarter of 2017. Tesla’s solar division continues to decline quarter-over-quarter, though it was supposed to right-side this quarter, according to the company. However, that prediction did not come to pass. Tesla reported that in the fourth quarter of 2017 it deployed just 87 megawatts of solar, which was 20 percent less than the amount deployed in Q3 2017. "Solar [megawatts] deployed declined as volumes continue to be impacted by our decision to close certain sales channels earlier this year and to focus on projects with better margins," Tesla stated. "In addition, solar deployments were affected by the short supply of Powerwalls for customers who wanted solar plus Powerwall in their house. While volumes may continue to be impacted by these factors over the near term, we expect growth to resume later this year." Tesla said it expects that the gross margin of the combined energy storage and solar unit will improve as it makes more Powerpacks and Powerwalls and gets better at manufacturing them at a lower cost. That’s usually the way it works: ramp up production and cut costs. Right now Tesla’s energy storage division is still in a fairly nascent phase. And scaling it up could be hampered by all the other efforts that Tesla is currently working on. With so many balls in the air, Tesla’s ramp of its energy storage division could face growing pains. For instance, in order to build the South Australian battery farm so quickly, Tesla turned to Samsung to supply the batteries instead of making them itself at the Gigafactory. The company continues to risk spreading itself too thin.